I have found foot stretching heaven with the help of ToeSox. These 90% Organic Cotton beauties feature a non-slip sole and are machine washable. 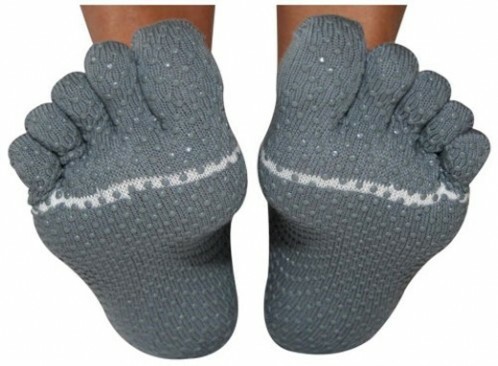 The ToeSox Yoga-Pilates Toe Socks with Grips are a great alternative to traditional athletic socks and even give you the added bonus of stretching toes and strengthening the foot muscles. They have a horizontal stripe on the metatarsal head to give a visual to support proper alignment. The toe stretchers increase circulation and reduce the chances of injury. The cotton is breathable which keeps the feet cool and reduce the friction between toes. ToeSox are pretty much the best thing that my feet have ever experienced. I hope that you all get a chance to try these fabulous little footsies out! When practicing Warrior Pose I, square your hips forward and keep them even.